I finally let the chicks and ducklings out of their shed to free range today. Because I have lost so many hens, ducks and rabbits to foxes, polecats and goodness knows what else I have been extremely careful with these new ducklings and chicks. So they haven’t got 4 acres – they have 10 square yards with a hedge and a duckpond – and a big shed. So it’s not exactly free range! 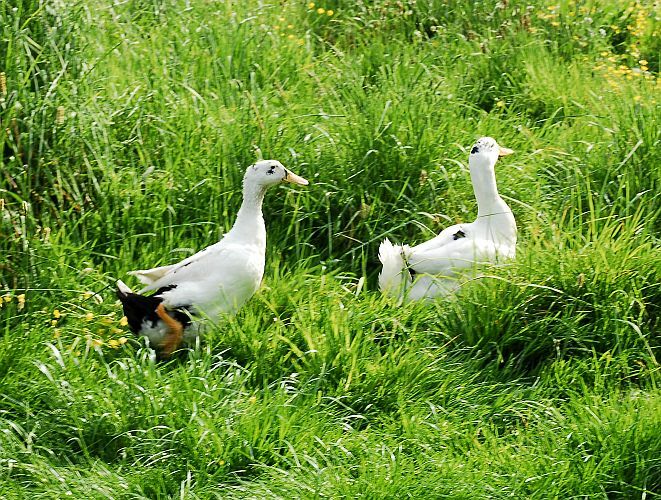 The first thing the ducklings did was eat some grass, then they ran round and round quacking excitedly, they are so delighted to be outside. They haven’t found the pond yet – I moved their water bowl outside and they are dipping chunks of bread in it. They keep out of the way of Doris (head honcho hen) but seem to get on fine with Grace (grey hen) and the chicks. They are very inquisitive, poking their beaks into everything, trying different plants – and spitting some of them out! They like plantains but not burdock or feverfew. When they find something distasteful they quickly dunk their beaks in the water bowl. It’s lovely to see them outside. They keep together – if one runs after something – the other quickly runs too. Grace has wandered off for a dust bath under the hedge – she seems very relieved to be out in the fresh air with some grass to eat. The chicks are exploring, occasionally cheeping to one another when they find something interesting – or get too far apart. They have most of their feathers but are still fluffy whereas the ducklings have all their feathers. Doris has followed Grace and gone off for a dust bath and left the little ones in peace. They are finishing off the bread and scraps. When Doris comes back to the water bowl for a drink, the babies keep well out of her way. It’s so lovely to see them all outside. 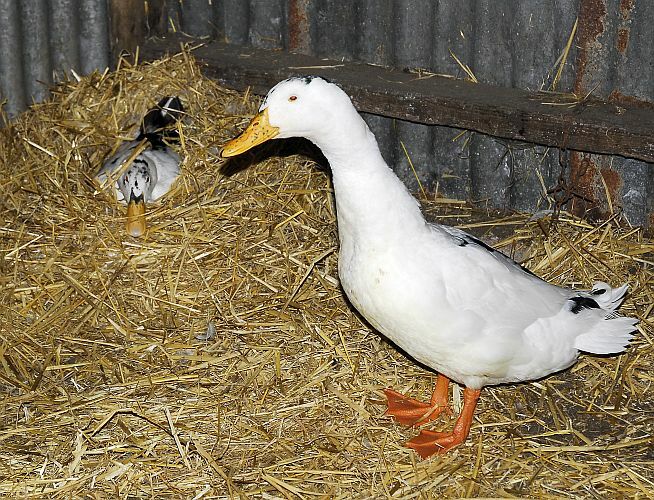 I decided this year might be my last chance to breed some Indian Runner ducks and some Dorking hens. Earlier in the year I had put a ‘wanted’ advert on Preloved for Dorking hens to go with Dillon, my Dorking cockerel. I had received a reply from someone in Yorkshire saying they had hatched some Dorking eggs and I replied that I would be interested when the chicks were a bit older. By the time I got around to replying, the fox had got Dillon (I was really upset as he was a wonderful, placid, gentle, friendly cockerel.) It was during the day and I was around outside most of the day – I just couldn’t find him at bedtime – searched everywhere and all I found was one tail feather. Anyway we went to Yorkshire to get three Dorking chicks. When we arrived, in the pen next to the chicks were some Indian Runner ducklings – so we came back with two ducks as well. I am so scared of losing them that they have been in a pen in the hen house at night and painstakingly moved to a pen outside each day. One of the chicks died – not sure what happened but one morning he just sat all hunched up and within a few hours he had gone. The other two are thriving, not sure yet of course if they are boys are girls! Now the ducklings are bigger I have let them have free run of the hen house but they are not going outdoors until I am sure they know where home is and I’ve checked that there are no gaps they can get through! The first day, they stood poking their heads out of the door and looking all around. Can’t wait until they go outside and find the pond! They love the water bowl and try swimming in it but they are much too big to even get their heads under the water now. We went to see Whalebone during their Mirabillia Tour at a Shropshire Wildlife Trust evening and were enchanted by the musicians and their special brand of folk music. They also play a spellbinding rendition of Stairway to Heaven. Our Martha has just decided to go broody so we might have some baby Arthurs and Marthas by the end of the month.